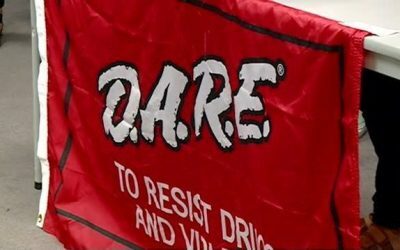 Spearfish Middle School seventh-grade students celebrated D.A.R.E. graduation Tuesday. 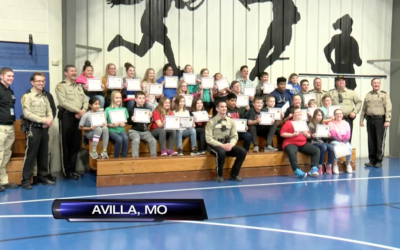 Pictured, students in Paula Farley’s class received certificates from Cpl. 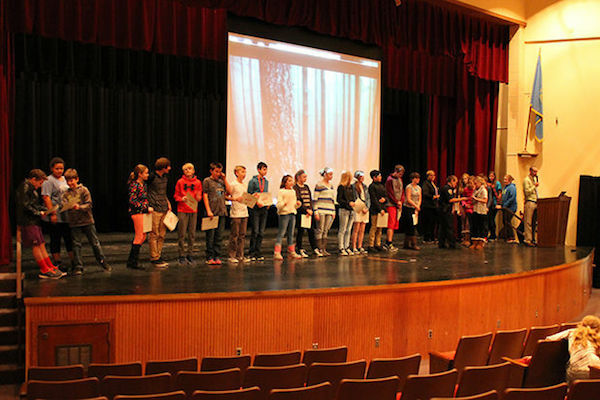 Verla Little as Assistant Principal Brady Sumners, far right, announced their names. Pioneer photo by Kaija Swisher. 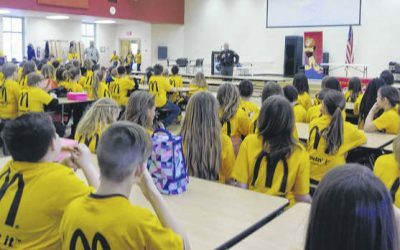 SPEARFISH — Seventh graders at Spearfish Middle School celebrated the successful completion of D.A.R.E. 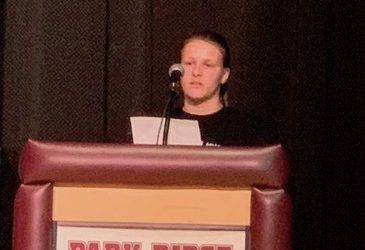 (Drug Abuse Resistance Education), a substance abuse prevention education program, Tuesday at a graduation in the high school auditorium. 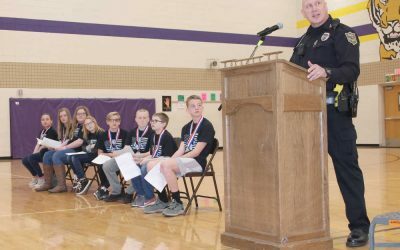 “These people over here that are here to protect and serve you every day, they come in and do this on their own time for you guys because they see the importance in this, and they’re trying to prevent some of the things that they see on a daily basis for you guys to ever do,” Assistant Principal Brady Sumner said, referring to the officers from the Spearfish Police Department who come in to teach the students during the semester: Officers Jason Gellett and Shawn Fox, School Resource Officer Candi Birk, and Cpl. Verla Little. 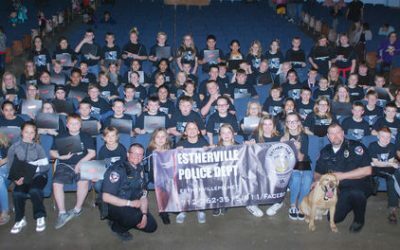 During the event, the students heard from Officer Collin Smith about the dangers of various drugs and substances and the dangers of bad decisions, and keynote speaker Fourth Circuit Judge Michell Palmer-Percy followed up on this theme. She reminded the students that the graduation did not mean that they were finished in their decision-making. “From now on, it means you have learned the tools necessary to go out and do the real-life hard work of making the good decisions,” she said, explaining that this is the start of new chapters in their lives. She told the students to ask themselves how they want their lives to look in the future, since life is the sum total of all the decisions we make every day. “These decisions are not going to be easy. When you’re faced with a difficult decision, you will struggle, but it is so much easier to make a hard decision than it is to correct the bad decisions that you make that pile up,” Palmer-Percy said, adding that she sees the results of bad decisions in her courtroom. She urged the students not to let drugs take away the things they want in their lives, whether career, home, travel opportunities, etc.  “You are the only one that has to live with the results of your decision, so never ever base your life decisions on advice of people who don’t have to live with the results of your decisions. In other words, you must make your own decisions because you can’t blame anyone for the result but yourself,” she said, urging the students to have confidence and courage in their decisions to make the best life for themselves possible. 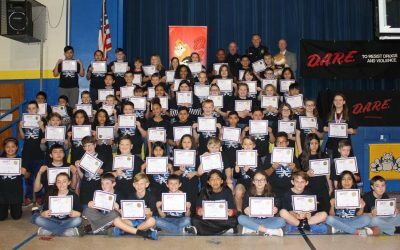 The students were recognized with D.A.R.E. 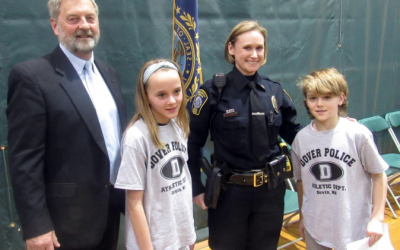 certificates during the graduation, and Sumners encouraged them to thank their D.A.R.E. officers. 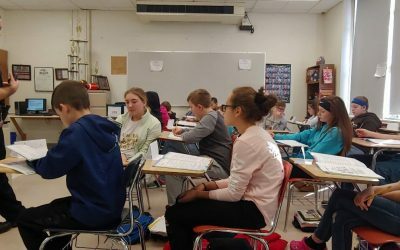 “We love having them in the classroom,” he said.